Let’s take a little break from homeschool curriculum and books and take a look at some suds! 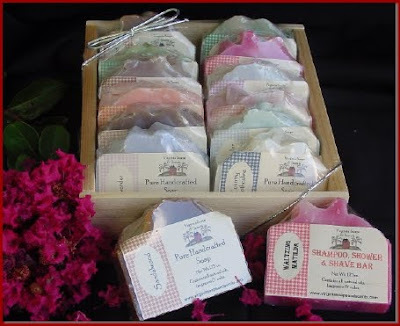 Virginia Soap and Scents makes soap the old-fashioned way, without any detergents. This company is owned by the Spargur family, homeschoolers who have taken their learning to a new level by starting a family business. After doing a unit study activity where they made soap the way the Virginia colonists did, they were hooked and decided to share their product with the world. This couldn’t have come at a better time, as a recent family tragedy had left the family a need for a creative outlet to work through their grief. As a member of the TOS Homeschool Crew, I received three “bed and breakfast” size bars of handmade soap (Coconut Lemongrass, Fresh Orange, and Oatmeal, Milk & Honey), a shampoo bar (Ginger Lime) and a trial-size laundry soap kit for review purposes. I received no other compensation. This review reflects the experiences of myself and my family. I am not and do not claim to be an expert concerning this product or any other product. I’ve loved handmade soaps for a while, in fact I used to make my own poured glycerin bars ages ago, ahem. Handmade soap has been wonderful for our youngest son’s skin condition, as it softens the scale and doesn’t dry him out the way those beauty bars you buy in the store will. So, I was looking forward to this review, though I didn’t expect any dramatic results. I was, however, intrigued by the shampoo bar, a product I had never tried before. The soaps, are, well, soap! Not the detergents you’ll get when you buy a beauty or bath bar at the supermarket, but made with natural ingredients, including olive, coconut and castor oils. They are scented with essential oils and, when a scent is not available as an essential oil, fragrance oils. They lathered up well and left my skin feeling clean, but not dried out the way beauty bars tend to. They also helped with my mid-day shine on my forehead. The scents were not overpowering, but fresh smelling. My fave was the Coconut Lemongrass. My children also enjoyed the soaps and fought over who could lay claim to each bar. As these were only trial-size bars (1.75 oz each) and my children are prone to leaving soap in puddles, they didn’t last long. (If you purchase these soaps, be sure to keep them in a soap dish that drains so they won’t melt away on you.) While we enjoyed the soaps, they are not really much different from any other handmade soap I’ve used, but I do like the idea of buying from a “Delight Directed Family Business,” and their prices are very good. The shampoo bar contains no added color and a high percentage of castor oil, a humectant. This was a new thing for me and something to get used to. Ultimately, it didn’t work for my super fine (yet very thick), oily, straight, long hair. It left my ends feeling stripped and my roots feeling coated and heavy. I tried rinsing with an apple cider rinse, which helped with the ends but still my roots felt heavy and over-conditioned. 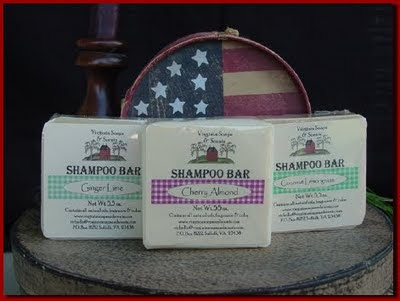 Virginia Soap and Scents does have a shampoo specially formulated for oily hair that I might be willing to give a try. Not wanting the shampoo bar to go to waste (my children didn’t seem to want to try it since it’s definitely not “tear-free”), we tried it on Peter’s skin. Peter has super dry, scaly skin due to Ichthyosis and while homemade soaps help, they vary a good bit on how much they help (it just depends upon the fats used in them). The shampoo bar with its high castor oil content made a marked improvement in the texture of his skin after only a few uses. Peter also hates to have his scalp and hair shampooed. My husband found that by using the bar to soap up Peter’s scalp, it was a natural enough transition from soaping his neck to soaping his scalp and he was much less resistant. I’d like to see how this bar does for him long-term and plan on buying some more. The laundry soap kit interested me greatly. I really like using natural products instead of chemicals when I can (and when it’s affordable), and have read many a blog post touting homemade laundry soap and how economical it is compared to store bought detergents. The trial-size kit made a half-gallon of soap, or enough for about 16 loads of laundry. 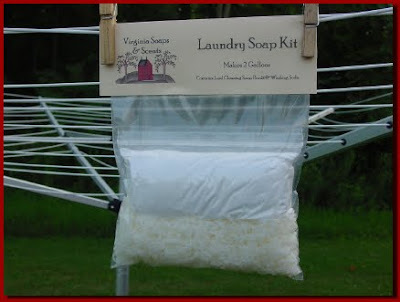 The laundry soap kit Virginia Soap and Scents sells on their website makes 2 gallons of gelled soap and will do about 64 loads. The laundry soap was easy to make, though it requires periodic stirring over a long period of time, and gelled super-thick (it’s more of a “scoop it” gel than a “pour it” gel, if you know what I mean). It takes about 1/2 cup per load, though you could play with this amount. And did it get our clothes clean? Yes…and no. It worked fine for our general laundry: the clothes belonging to 5 family members and the towels. It did not work so well for Peter’s clothes. Let me explain how I wash Peter’s clothes. Peter has to use heavy petroleum-based ointments over most of his body, and petroleum does not wash out well---over time it takes a real toll on his clothes because some is always left behind. Ordinarily when I wash Peter clothes, I use the normal amount of detergent (the line in the cup for a regular load), put the clothes in soak in HOT water for at least a half hour to an hour, spin it out, then do a hot water wash and warm water rinse. After doing a load of Peter’s clothes, I then have to scrub out the washer with a brush and more detergent and run it through a short hot water wash cycle to remove residue (and dirt stuck to the residue) left behind. It took me a while to come up with this routine and it works pretty well to keep his clothes presentable for as long as possible. I tried the same routine with the laundry soap. The clothes were not as clean as they are after washing with detergent, they still looked oily. The washing machine was also more difficult to scrub out…the soap seemed to make the residue “stick” more to the inside of the drum and to the plastic agitator. Now obviously the average person will not have this same challenge, but this experience may give some indication of how it will work with grease. I’d consider using it just for my general laundry if it would save me money, but after some calculating I found that if I make my laundry soap using Virginia Soap and Scents’ kit, it will cost me more than buying the dye-free, scent-free detergent I normally buy and I’d have to make it. I might be able to save a little by purchasing their cleaning bar and providing my own washing soda and borax, but not a significant enough savings after adding the time factor in. That said, I’m looking forward to buying some soaps and they have some great sounding scents for the holidays (their bulk prices are pretty good, too, so these have got inexpensive Christmas present written all over them). Virginia Soap and Scents also has a number of other products available, including shea butter balm, body balm, body powder and gourmet soaps. Products are available in assorted scents and unscented. For prices on other products and a full list of all their available scents, go to Virginia Soap and Scents. Note: Virginia Soap and Scents does not claim that their products are purely vegetable based or vegan. You're getting awesome stuff this year!